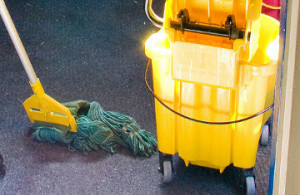 Proper cleaning depends on good equipment, good staff, and good supplies. It also relies on dwell time. When an all-purpose cleaner is used on floors, walls, windows, and other surfaces, it needs to remain on a surface for a specified amount of time for it to properly penetrate dirt and disinfect. Spraying and wiping will not allow the cleaner to perform at its full potential, and will reduce the effectiveness of an otherwise excellent cleaning program. Each product has a different recommended dwell time. Some can last a few minutes, while others may need a 10 minute dwell time or longer. Make sure that you and your staff are fully aware of the dwell times of the cleaning products you use. Although manufacturers are required to post dwell time specifications on cleaning product labels, it remains up to cleaning staff members and trainers to make sure those requirements are followed. Surveys have showed that many end users simply apply and immediately wipe a surface, assuming the cleaning product will take full effect. That type of cleaning is ineffective for proper disinfection, however. Taking the time to allow sufficient dwell time can reduce infection in work places, school, hospitals, and other areas where large numbers of people are exposed to high touch surface and high traffic areas. Training is an important and effective method for ensuring proper dwell times. Emphasizing the importance of top to bottom cleaning methods can help increase dwell times and improve disinfection rates. Using a top to bottom cleaning method can also be a useful way to ensure that cleaning supplies have enough time to fully penetrate dirt, grime, and odor-causing urea crystals in restrooms. By applying a cleaner to all the surfaces of a room and then working from the top of the room down, all areas will be fully saturated and disinfected by the cleaning agent. Dwell time alone is not the only factor that determines proper disinfection. Thorough scrubbing and adequate rinsing techniques are also required to achieve adequate conditions for disinfection. Clean cloths, mops, and other cleaning equipment should be well maintained and properly used when cleaning disinfected areas, as well.